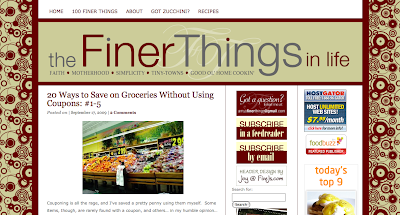 Today we're critiquing the blog, The Finer Things in Life, a WordPress blog that's been around since July 2008. Blogger Amy is a Kansas mom of three. 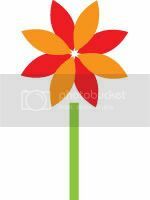 Recent post topics have included couponing, recipes, meal plans, and inspirational family life essays. 1. First Impressions - Is my design clean and professional? What about the sidebars...too much? All the important stuff in the right places? Easily accessible? 2. Niche -- Do you get a good feel for my blog by reading the tagline and about page? Do my category titles and posts reflect my theme? Can you tell what The Finer Things in Life is all about? 3. Content -- I don't take the time to read many long posts, so I try to not write them, either. If you browse through a few posts, are they easy to read without being too long or too short? 4. Next level -- I currently average 20,000 unique visitors and 45,000 page views per month. What can I do to take my blog to the next level? What do you think, BlogCoach readers? Can you offer Amy some feedback about her blog?